Carabiner lip balm features our standard mini carabiner with waterproof and moisturizing lip balm in a natural base and includes SPF 22 (uva/uvb) sun protection. Mini carabiners are laser engraved with your name, logo or message. Optional full color custom imprinted label. 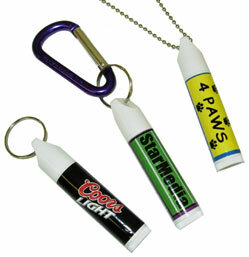 Carabiners with lip balm are very functional and practical promotional carabiners! Great for parties and special events. Available in a white tube with a custom full color printed label. Imprint area: 1.50" x 0.15"
Carabiner lip balm are Lowest Price Guaranteed!